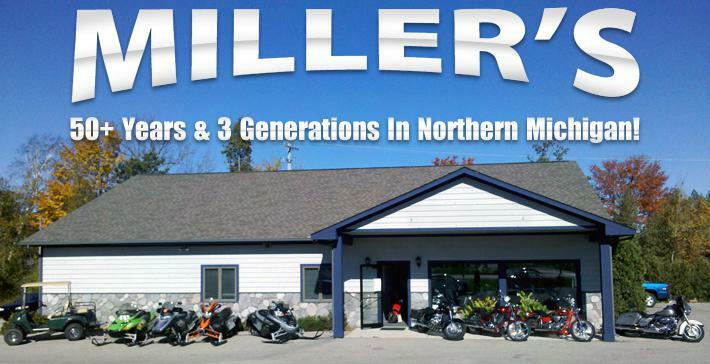 Miller's US 31 Sales, family owned & operated, no franchises, 50+ clean, like-new, low mile used motorcycles in stock. North end of Petoskey on US 31 across from the Ford/Chrysler dealer. 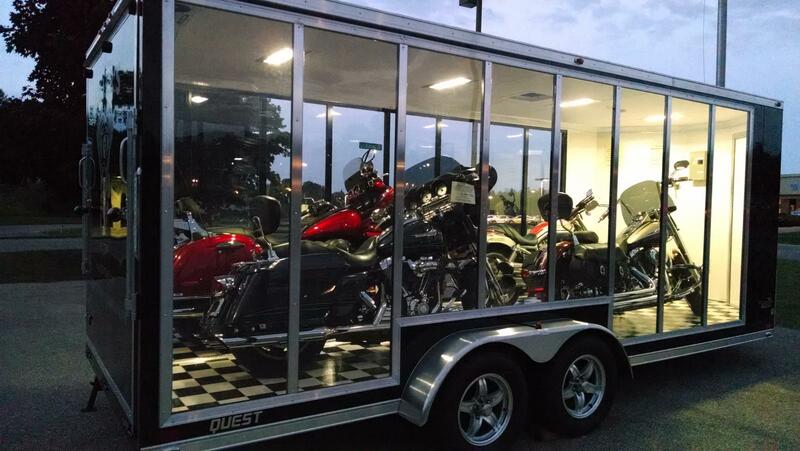 Trade-ins welcome - motorcycle, power sports, auto - credit union financing available, shipping and delivery available. 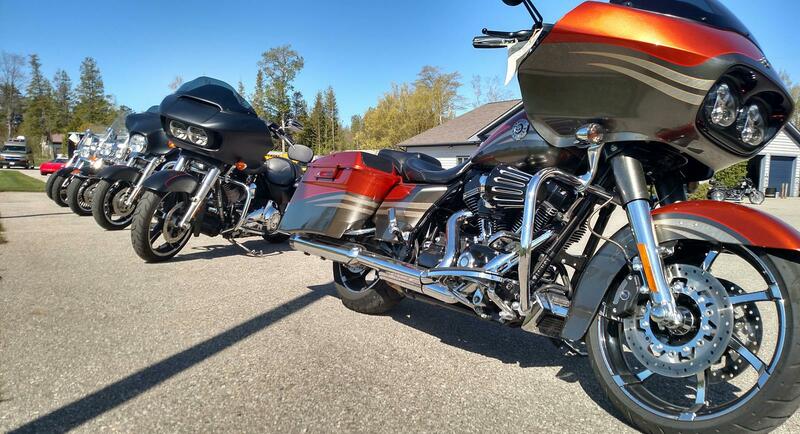 Super Glide style kicked up a notch, with lots of chrome and plenty of power. Twin Cam 96™ Engine Heritage: The knowledge of what makes an engine truly move a rider runs deep at The Motor Company, and it was put to good use when we created the Twin Cam 96™ engine. We sweated bullets perfecting every cubic inch, pushing design and technology forward. And we did it all without compromising one bit of Harley-Davidson's unique styling. Evolved, yet carrying on the legacy of the Flathead, Knucklehead, Panhead, Shovelhead, Evolution® and Twin Cam 88® engines that came before. 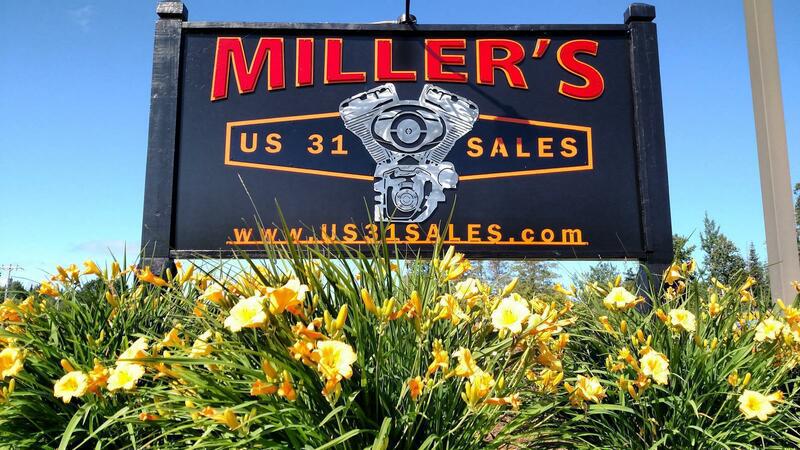 The performance and durability are a direct result of the untold miles logged on the V-Twin since 1909, and the proud heritage that comes from a century's worth of commitment to life on two wheels. Twin Cam 96™ Engine Innovation: Fire up the Twin Cam 96™ engine and feel the low-end torque unleashed. Thanks to the lightweight piston design, delivery of the added power is more refined than ever. Then put your foot on the shifter and feel how the engine and Six-Speed Cruise Drive® transmission were designed to work together. Six speeds. A strong driveline and strong internal parts. Low routine maintenance. And a low cruising rpm couldn't feel better. 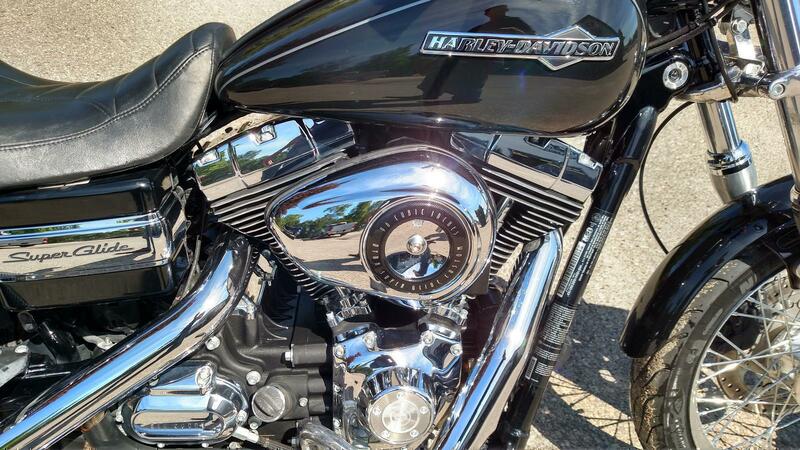 Pure Harley-Davidson Styling: Feast your eyes on the Twin Cam 96™ engine and there's no mistaking its roots. This is authentic Harley-Davidson style through and through with an attention to detail you won't find from any other motorcycle company. Black powder-coated heads and cylinders are highlighted by machined cooling fin tips and chrome rocker covers. It's a jewel machined out of metal. Pure. Dripping with power. From the classic edge of the cooling fins to the clean lines of cases and covers—the Twin Cam 96™ engine makes an ironclad statement to holding on to what's right and staying true to what satisfies the rider. Six-Speed Cruise Drive®: You want a ride that rumbles—not begs for mercy—when you lean on it a little. The Six-Speed Cruise Drive® transmission provides smooth, quiet shifting and reduces engine speed on the highway, so you get a better match between engine turnover and road speed. It's a rare ride when a bike responds like this, and a low growl goes a long way when you're opening up the road ahead. Artfully Hidden Technology: Harley-Davidson leverages the latest in technology without compromising style and function. That means we hide electronics. The whole wiring harness is skillfully routed behind the jewels of the bike—the tank, engine and all the other eye-popping features you want to see. It's just another way The Motor Company goes the extra mile to give its bikes that premium, top-of-the-line fit and finish. Intuitive Controls: Hand controls on a Harley-Davidson® motorcycle are incredibly intuitive. The turn signals are self-canceling and, based on the speed and angle of the motorcycle, they know how long to stay on. Engaging the controls quickly becomes second nature so you can focus less on turning off your signal and more on basking in the freedom of the ride. H-D® Smart Security System (Optional): The factory-installed next-generation security system features a hands-free fob that automatically arms and disarms the vehicle electronic security functions as you approach and walk away from the bike. Stick the fob on your ignition key ring and let it do all the work. It's this attention to details and security that make Harley-Davidson® motorcycles unique. Offered as a part of the 'Security Package' (which includes Anti-Lock Brakes). Anti-Lock Brakes (Optional): You may be cruising with swagger, but you know safety counts. This sophisticated, factory-installed ABS gives 'stopping power' a double meaning. Its components are tastefully hidden within the wheel hub, so you'll still turn heads with clean, streamlined design. But more importantly, you get certainty in the saddle knowing your bike's going to behave when you need it. 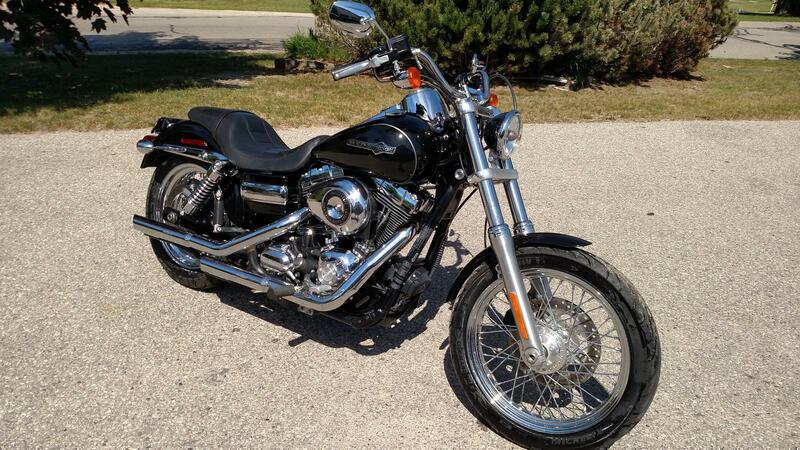 Offered as a part of the 'Security Package' (which includes the H-D® Smart Security System). Adjustable Suspension: Preload is easily adjusted with a spanner wrench to make your suspension suit you and your riding style. 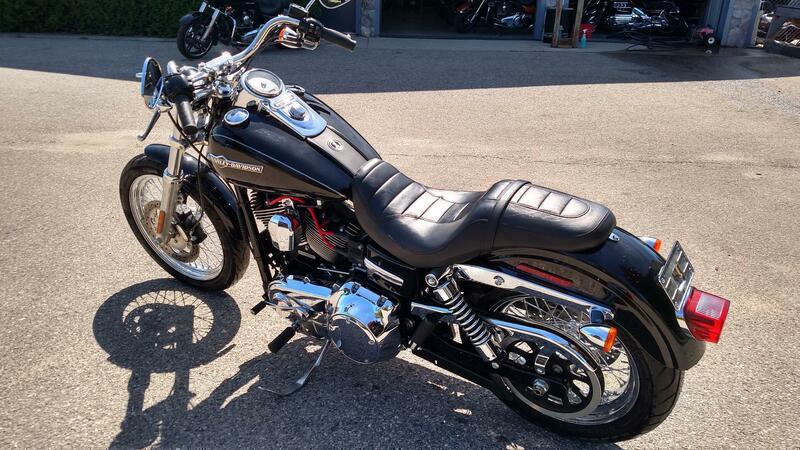 The slammed low rear suspension gives you a more laid-back riding position and style. Low-profile, kicked back for profiling down the boulevard and hugging corners. Tuned to Be Ridden: Harley-Davidson® motorcycles are different from any other bike out on the road. There's a balance to them. The steering, the maneuverability—it's all in concert. And each Harley-Davidson® model is tuned differently to create a unique riding experience for each individual no matter which bike they swing their leg over. Let's face it, we didn't get to where we are by being like everyone else. Michelin® Scorcher™ Tires: Michelin® Scorcher™ Tires provide the superior performance, sensational grip, impressive durability and excellent handling expected on a race-bred bike. The exclusive deep-cut tread design improves grip and water evacuation capability. Grip performance and durability is also enhanced by the tire's rubber compounds, which use the latest generation of Michelin synthetic polymers. Under the rear rubber, aramid belts are used to stabilize your ride, which helps inspire confidence in handling. Mid-Mounted Controls: Let your boots fall where they may, naturally to the mid-mounted controls and rider foot pegs on the Super Glide® Custom model. An easy reach and tight rider triangle is confidence-inspiring for new riders eager to set off on their journey and riders whose legs run slightly shorter than others. Pullback Handlebar: The Super Glide® Custom model comes standard with a stainless steel pullback handlebar that provides a laid-back riding position for comfort and profiling. 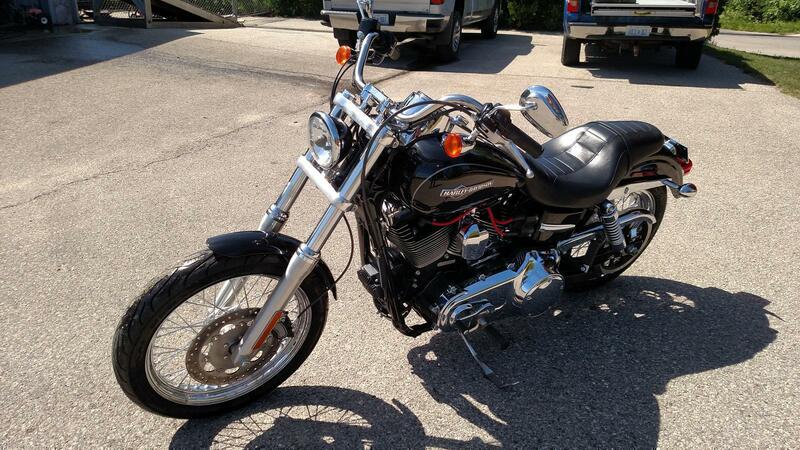 It's the perfect handlebar for cruising endless country roads or tearing up the boulevard. Seat Engineering and Design: The seat is home for Harley-Davidson® motorcycle riders. They want a seat that has unique style without sacrificing comfort. Because of that, Harley-Davidson invests a lot of time in researching, designing and testing seats so that every bike has just the right saddle. 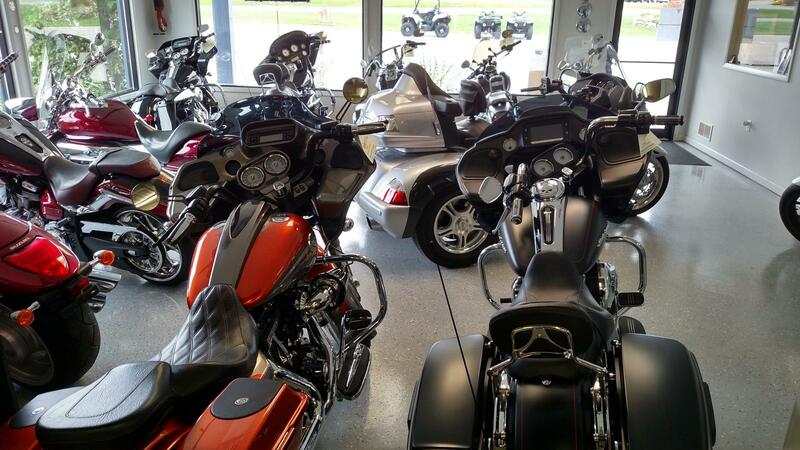 Engine Idle Temperature Management Strategy: Our motorcycles are built to be ridden. A lot. So that means that rider comfort is top of mind. Always. With the Engine Idle Temperature Management Strategy (EITMS) feature, the motorcycle automatically cuts fuel and fire from rear cylinder when idling, which helps reduce engine heat felt by rider and passenger. This feature can easily be turned on by your dealer. Premium Custom Styling: From wheel to wheel, the Super Glide Custom® motorcycle is a chromed out feast for the eyes, blazing with high-end finishes as it holds true both to its heritage and its custom designation. Its powertrain highlighted by machined cooling fin tips and chrome rocker covers. Its tank-mounted gauges engulfed in chrome. Its solid stainless steel pullback handlebars, polished fuel tank medallion and iconic battery box cover gleaming with iconic Harley-Davidson attitude. And the 110th Anniversary Edition's Smoothie Laced wheels add even more gleam—chrome-laced, tubeless and featuring a distinctive smooth profile and an extruded aluminum rim, they look great and are lighter than traditional steel wheels with tubes. 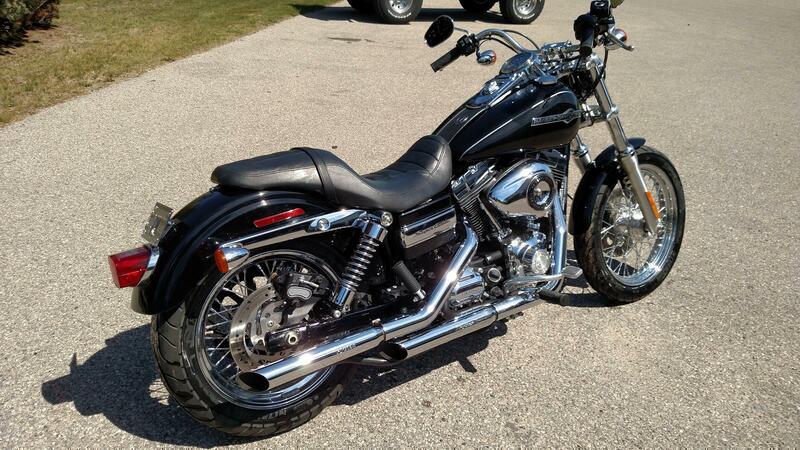 These premium touches make this a one-of-a-kind custom ride—not to mention a smokin' deal. Premium Paint: Up to two times thicker than the competition, custom quality paint comes standard on all Harley-Davidson® motorcycles. Clearcoat layering up to five mils deep. Bigger metal flakes. Unique effects in the sunglo and pearl colors. Skimping simply is not in our vocabulary. Hand Finished Fuel Tank: All Harley-Davidson® fuel tanks are finished by hand—that's what makes them stand out from the competition. Their seamless design and unmatched style are unique among all motorcycles on the road. The tanks are one of the first and last things people notice when they lay their eyes on a Harley-Davidson® motorcycle—so we make it worth their time.